South Korea suffered their second most powerful quake ever this morning after a rare earthquake of magnitude 5.4 rattled South Korea, its second most powerful quake on record, shaking buildings but causing no major damage or injuries. The quake struck about 9 km (5 miles) north of the southeastern port city of Pohang, the Korea Meteorological Administration said in a news briefing. According to Reuters Tremors were felt across the country but operations at nuclear reactors were not affected, the state-run nuclear operator Korea Hydro & Nuclear Power Co said in a statement. South Korea has relatively little seismic activity, compared with Japan to the east. Its strongest quake on record was magnitude 5.8 in September last year. 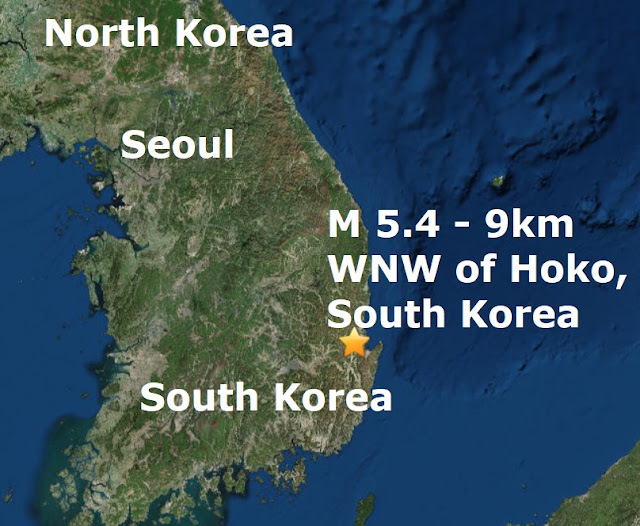 An artificial earthquake movement of a magnitude 6.3 on the Richter scale was recorded near the Poonggaeri area in North Korea a South Korean military official told NBC News in September 2017. The event was recorded around 14 miles northeast of Sungjibaegam the USGS said. China's earthquake administration says the quake was a "suspected explosion,"